Reducing the canopy cover (e.g., forest thinning) is one of the most commonly employed forest silvicultural treatments. Trees are partially removed from a forest in order to manage tree competition, thus favoring the remaining and often the most valuable trees. The properties of the soil are affected by forest thinning as a result of changes in key microclimatic conditions, microbial communities and biomass, root density, nutrient budgets and organic matter turnover. The aim of this study was to determine the soil microbial biomass C, N and respiration (basal respiration) in a black pine (Pinus nigra Arn. subsp. pallasiana) forest in the Mudurnu district of Bolu Province (Western Black Sea Region, Turkey). Whereas forest thinning was found to cause increases in the soil temperature, microbial biomass C and N and organic C, it was found to decrease the soil moisture, basal respiration and metabolic quotient (qCO2). As expected, soil organic C exhibited a strong impact on soil microbial biomass C, N and basal respiration. 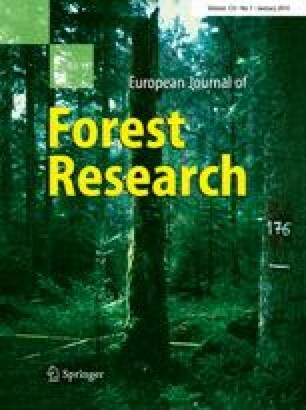 It was concluded that the influence of forest thinning on the microbial biomass and soil respiration was the combined result of changing microclimatic conditions and soil properties, such as forest litter, soil temperature, soil moisture, soil pH and soil organic matter. I am grateful to Assistant Professor Hüseyin ŞENSOY, Research Assistant Kamil ÇAKIROĞLU and Chief of Forest Management Yusuf ADIGÜZEL for their valuable efforts during the field and laboratory works. The Turkish General Directorate of Forestry (TGDF) and Turkish State Meteorological Service (TSMS) are also gratefully acknowledged for their data support throughout this study.